Hondius, born in Holland, studied at the Royal Dutch Academy in The Hague, and then in New York at the Art Students’ League with Max Weber and Andrew Dasburg. He was a member of An American Group, a professional organization founded in 1931 to arrange exhibitions of “individualistic artwork.” He became known for his depictions of circus scenes, ballerinas, still lifes, and landscapes. 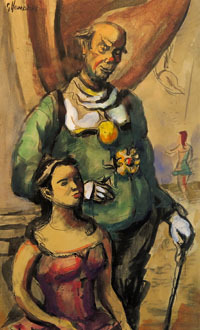 He exhibited at the Whitney Museum of American Art (1924-1926, 1932, 1934, 1945), at the 1939 World’s Fair in New York, at the Golden Gate Exposition in San Francisco in 1939, at the Museum of Modern Art in New York, at Rockefeller Center, and at the Graham Gallery in the 1950s. During his lifetime, Hondius had fifty-five solo exhibitions in the United States and Europe. His work is in the permanent collection of a number of museums, including the Whitney Museum of American Art, San Francisco Art Museums, Reading (Pennsylvania) Public Museum and Art Gallery, and the Provincial Museum in Kampen, Holland.